To make sure we catch the thrilling finale to The West Wing, J and I are taking Wednesday (US Tuesday afternoon & night) off from work.Â Tragic, we know, but we’d be useless at work and drinking games are frowned upon the day after the Melbourne Cup. I’m sure it won’t be like this time eight years ago when I spent the night in a New Jersey hotel room, still waiting at 3am for a result.Â The next day I flew to Orlando Florida to attend a trade show.Â My most vivid memory was when, completely unprompted, my taxi driver apologised to me on behalf of his state. It didn’t help much when I posted it four years ago. Nonetheless, I’m going to roll out Leonard Cohen’s Democracy (video) one more time. As mentioned previously, we recently acquired an Apple TV and a fairly standard 720p 66cm LCD TV. After spending some time in the US, we have Australian and US iTunes Store accounts. For the last year the majority of our TV came from one iTunes store or another (mostly one). We grew tired of advertising and DVDs. J & I promised that when we gave up our roughly $100/month cable subscription a few years ago that if legal downloadable content became viable we’d be happy to pay at least half that amount on content we could select for ourselves, watch at our leisure, and enjoy without advertising. We’ve also recently boxed a few hundred CDs and put them in storage. This came about after we realised we’d purchased a shedload of music, but only about one physical CD per year for about 2 years. We needed a more convenient method than an iTunes library on a NAS to access our music collection. We’re paying to be hostages to iTunes DRM. It’s not great. We got over it. It’s an always-on jukebox of all our favourite hits which is easier to use than a CD player and doesn’t become scratched and unplayable when handled by children or visiting Luddites. Fewer hours spent fiddling with PCs or digging for DVDs. Just cursor around and watch. Bored? You can drop a few bucks on a hire movie and watch straight away with little chance of there being a big fingerprint on the final chapter that stops you from enjoying your purchase. What didn’t I know before I bought it that I should have? I got the 160GB version, and not the 8040GB thinking that I had to be able to manually carve up our 220GB of content and I’d prefer to have as much of it available as possible to avoid having to make too many decisions about content. Truth is, you don’t really need to go overboard with hard disk space. I have about 40GB of audio, and when you set the Apple TV to decide what to sync for you, it seems to allocate enough space for my entire audio collection and uses the rest of the space on what video it divines I’m likely to want t watch. Automatic sync works by constantly updating the content of the Apple TV with the iTunes libraries on your network to try to make sure the content you care about is online when the iTunes libraries aren’t. If your iTunes library is online, the Apple TV shows the content of those libraries as available through the menu system and if you play something that isn’t on the Apple TV’s hard disk, it begins to copy the content onto its hard disk and starts playing when it’s confident there won’t be a break in transmission to re-buffer. The Apple TV seems to be hard or slow to wake up after a rest. Often you have to poke away at the remote for 15-30 seconds to get it to display or utter the first "bloops" of evident wakefulness. Very occasionally the Apple TV appears to thrash like a computer and be consistently unresponsive. Twice I’ve had to switch it off and on to restore sanity and responsiveness. What this doesn’t tell you is that for some reason, when you’re paused in the middle of an Apple TV-purchased movie, your Apple TV also likes to do resyncs if you accidentally leave your iTunes running on another PC. I suspect it’s zealously syncing where you’re at in the movie so it can restart you from that point on any other iTunes instance. The problem with this is that resyncs while you’re in the middle of a TV show or a movie cause the Apple TV to become unresponsive or sluggish and stuttery for a time. It seems to take upwards of a minute to recover from a resync commenced when you paused a feature-length film. The unit becomes unresponsive, eating remote control clicks or misinterpreting them as click-and-hold commands. I typically spend some time after the Apple TV has recovered from sluggishness trying to find my way back to where I originally paused. This is probably the biggest disappointment. It seems to me to be a bug. Resyncs should be transparent to the user of the Apple TV and certainly shouldn’t affect usability or response time. Fingers crossed for a fix. With Automatic sync the Apple TV loads up on video content you haven’t watched yet and content you have watched tends to be deleted to make way for new content. The downside of this for us has been kids’ content. We have Dora the Explorer on high rotation, and the Apple TV liked deleting Dora in favour of other content. Now that Dora has been watched a few hundred times Apple TV has taken the hint, but having to boot up a PC to get Dora on the air was a little more tiresome than I expected. It would be nice if you could explicitly hint that you’d like to prioritise some content for caching on the Apple TV. Apple TV is visually polished, extremely well integrated with all things iTunes, yet suffers the same poor responsiveness of other computers that pretend to be HiFi equipment (I’m lookin’ at you Media Center PCs). It’s not as polished and predictable as I expected. On the whole, as an iTunes-dependent family we’re hooked and find it indispensable. Without an iTunes addiction it wouldn’t make a lot of sense. 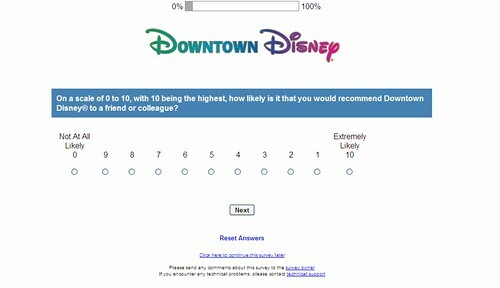 Apparently Disneyland aims to polarise its guests. Or perhaps if you weren’t pissed off or ecstatic about the experience they don’t really care if you’d recommend them to others. Some parents of kids in Mr 5’s class have expressed concern that the school-hours scripture classes are a little too “Fire And Brimstone!” Some kids have been coming home from school talking about death and pretty upset about their parents’ prospects for admission into heaven. We hadn’t noticed anything particularly odd. A Moses colouring activity came home with a light saber once. At age 5 everything looks better with a light saber. I decided to check out what Mr 5 thought about his scripture classes. They’re always talking about God and Jesus. Mostly Jesus. They really like Jesus. Jesus is really powerful. She has some big dogs who can cure blindness by licking people. He hasn’t heard the joke about the dyslexic insomniac agnostic. Blade Runner, in any of its forms, is clearly one of the finest science fiction films ever made. While enjoying our new Apple TV last week, I succumbed to the temptation to buy the high definition Definitive Cut version and watch it. I’ve seen pretty much all of the versions of Blade Runner multiple times — even the versions with reluctant Harrison Ford voice-overs. I didn’t expect much more than to be washed over by very leisurely-paced science fiction film noir nostalgia and marvel at how Admiral William Adama has grown. I was struck by just how much nostalgia there was to be had. RCA: Purchased by GE in 1986 and gutted. TDK: Not dead, but owned by Imation since 2007. Atari: A brand being revived post-1980s as the adopted name of Hasbro Interactive and Infogrames. Pan Am: Does not require explanation. Apart from Atari, these brands don’t look terribly likely to method act their way to a triumphant resurgence in 2019. I was foraging around in some old boxes when I found a small collection of things that used to be in Amigas I have owned. 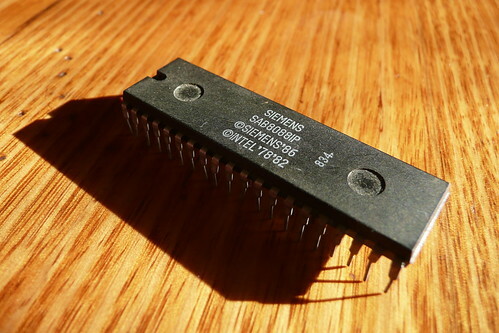 I believe this might be the processor I swapped out for a 68010 in a vain early attempt at a speed upgrade (the Amiga 1000 was architected to be synchronous with PAL and NTSC video frequencies so overclocking wasn’t even a dream back in the day). I recall severing one of the pins during some overenthusiastic and too-frequent brain transplanting, but the one you see above is bent up a bit yet doesn’t have any missing pins. It’s in better condition than my own brain’s recollection of where this processor came from, it seems. The 68010 was mostly indistinguishable in performance from the 68000 and screwed up many of the games of the day, possibly because of their reliance on the 68000’s loop speed as a precision timing mechanism. I used to pop it in and out while I was searching for the 68010 emperor’s new clothes. 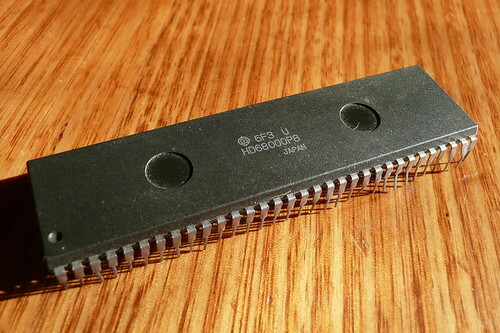 Eventually the 68000 and 68010 gave way to a 16MHz 68020 & 68881 LUCAS board, which provided excellent bang per buck in terms of performance and ram upgrades, and allowed the 68000 to be switched back in for games compatibility. 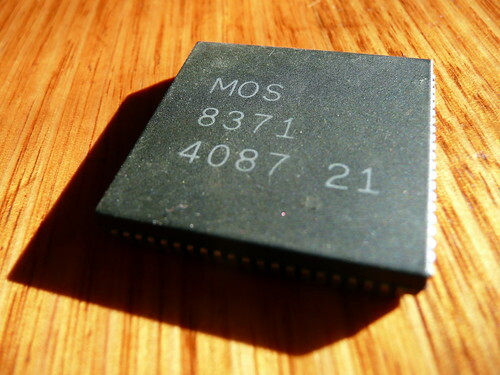 This was the chip responsible for most of the bling in typical Amiga graphics demos. It contains a hardware blitter, video coprocessor, DMA controller, and a bunch of other functionality. I can’t recall the fault, but I can recall that replacing it made life a little better. The Amiga Sidecar was an IBM PC clone in a box that, as you can tell from the Wikimedia image, did not make the Amiga any prettier, but it did provide an inconvenient and expensive way to run PC programs and a relatively inexpensive route to hard disk capacity. If I recall correctly the PC ran independently but through “Janus” software the PC screen was accessed through a program running on the Amiga Workbench. There were also a bunch of utilities for sharing data and text between the two computers. The processor above was supplanted by the almost perceptibly faster NEC V20 processor. SCSI controllers and drives were insanely expensive, if technically superior, when the Amiga 1000 was ascendant. With a Sidecar you could get a relatively cheap PC hard disk controller and PC hard disks to share with the Amiga side. All of this brings painfully to mind the startup scripts that I used to write and debug to deal with booting from a floppy, and handing off to the hard disk with subtle timing and software incompatibilities between booting with the Sidecar and LUCAS boards in different modes. Is Optus making iTunes Music Store usage unmetered? I’m going out on a limb. I think Optus is going to be giving more than just iPhone users unmetered access to Apple’s Internet properties. Yesterday I downloaded Season 2 of the best TV ever. Thankfully HBO have been gradually adding seasons of The Wire to the US iTunes Music Store, and I’ve been buying them and making my way through them. I was a bit concerned with how big a season is. 7.5GB is a good chunk of my 30GB quota. Not too big a deal but last month iTMS Daily Shows & Colbert Reports, work VPN and random tinkering put me over the 20GB mark. I checked the Optus web-based usage meter how much of my quota I had used in the first 5 days of July: About 2.5GB. I set off and downloaded four episodes. About 2.5GB of files. When they had finished downloading I waited a couple of hours and went back to check the Optus usage meter. It had registered 259MB of activity. Maybe it was being particularly slow to update. Anyway, I downloaded the remaining 5GB, watched two episodes and went back to check my usage: 3.8GB. Because I needed to put one of my Office 2007 Home licenses on the kids’ PC, I downloaded it (298MB) and checked usage again: 4.1GB and holding steady. 7.5GB of “The Wire” from iTunes cost me about 1.3GB in usage quota. 298MB of installer from Microsoft (via Digital River) cost me about 298MB of quota. I’ve hunted through my contract and I can’t see anywhere where it says Apple is some Internet usage metering haven. My only explanation is that Optus can’t, or won’t, just give iPhone users free access to Apple Internet resources and they’re engineering their network to treat everyone like an iPhone user. I can’t think of any explanation for why Optus is charging me somewhere between full rate and zero in quota. Is there something I’m missing? Secret Optus brownie points for not using BitTorrent? Most people who complain about the Optus usage meter say it over-counts their traffic. After reading about and enjoying the Firefox 3.0 about:robots “feature,” Mr 5’s $8 plastic gift for accompanying me to the markets today might have been a subliminally-suggested choice. We acquired a fashivhably coloured, double-luffing, go-ahead homage to a silly software release mascot. For fans of robots, this model screams “Fire. Fire. Get down!” deafeningly and something else we can’t make out. Non! Stop! All the while swivelling its randomly illuminated plastic torso and waggling its arms up and down. He falls over due to being newly hatched from a Styrofoam incubator — and he’s obviously not yet accustomed to his roller skates. “Could sound a beautiful music” (which we assume is a rough translation for “emits loud screaming and gunfire”) led to Dobo Arigato Mr Beat Magnum having a nasty run-in with J.
Mr 5 couldn’t hear his mother screaming at him to make the bad robot stop. He’s is missing an arm now (Mr Beat Magnum, not Mr 5), complete with dangling wires. This makes him look much cooler and we have a war story about the time he sacrificed an arm to save Mr 5 from harm. Worth reading just for the introduction. Esoteric novels? They were the finest of their indescribable genre. I blame sleep-deprivation for a lack of even sporadic blogging. Rather than kick off a del.icio.us linkspam bot, I’ll just refer you over to the rightleft. My Google Reader shared items change far more frequently than this blog. That widget is powered by the wake of my leveraged synergy drive.